DianaGabaldon.com | Live Web Interview – Oct. 11! Live Web Interview – Oct. 11! All Outlander fans from around the globe may view (or replay) a live web interview with Diana Gabaldon on Sunday, October 11, 2015! THE OFFICIAL OUTLANDER COLORING BOOK, which features images of scenes from Diana’s first novel, OUTLANDER, as interpreted by multiple artists. The interview begins at 7:00 p.m., Pacific Time (which is 10:00 p.m. in the Eastern time zone). It will last for an hour. The Pen’s Barbara Peters will interview Diana. Watch it live, or use the same link to watch it later! Diana will be joining the Pen’s live interview remotely through the Web, so the this is not an event that readers may attend in person at the Pen. Submit Your Question For Diana! Staff of the Poisoned Pen will select questions for Diana during the live interview from those that you submit! The last day to submit your question is Friday, October 9. Signed Copies of Diana’s New Books! 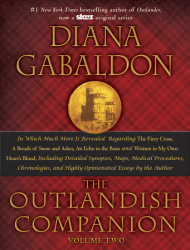 Order a signed copy of THE OUTLANDISH COMPANION, VOLUME TWO from the Poisoned Pen bookstore. Order a signed copy of THE OFFICIAL OUTLANDER COLORING BOOK from the Poisoned Pen bookstore. Your order will be signed by Diana after publication on October 27 at her next visit to the bookstore, and sent to you promptly. You may also order new, signed copies of her other titles along with the two new books. The Pen ships around the globe. Note that additional inscriptions and personalizations (such as “To Judy”) are NOT available with Diana’s signature, due to her demanding schedule. Due to her busy calendar, Diana will NOT be available for multi-city book tours for the two new books, organized by her publishers. She will also not be available for a live book launching event in the Phoenix area in October for the new books, such as those organized by the Poisoned Pen in the past. However, remember that anyone around the globe with web access may watch—or replay—the Pen’s live interview with Diana on Livestream in mid-October! Click here for more information about ordering signed copies of all of Diana’s books from the Poisoned Pen bookstore. This page was last updated on Thursday, October 8, 2015 at 4:44 a.m. (PDT) by Loretta, Diana’s Webmistress.